Dips is our popular stereographic projection program for the analysis and presentation of orientation based data. Determine joint sets, perform kinematic analysis of slope stability, and more in this multi-purpose tool. Dips works well with a suite of rock tools, including SWedge and UnWedge. Dips is designed for the interactive analysis of orientation based geological data. The program is capable of many applications and is designed for both the novice user and for the accomplished user of stereographic projection who wishes to utilize more advanced tools in the analysis of geological data. Dips allows the user to analyze and visualize structural data following the same techniques used in manual stereonets. In addition, it has many computational features, such as statistical contouring of orientation clustering, mean orientation and confidence calculation, cluster variability, kinematic analysis, and qualitative and quantitative feature attribute analysis. Dips is designed for the analysis of features related to the engineering analysis of rock structures, however, the free format of the Dips data file permits the analysis of any orientation-based data. 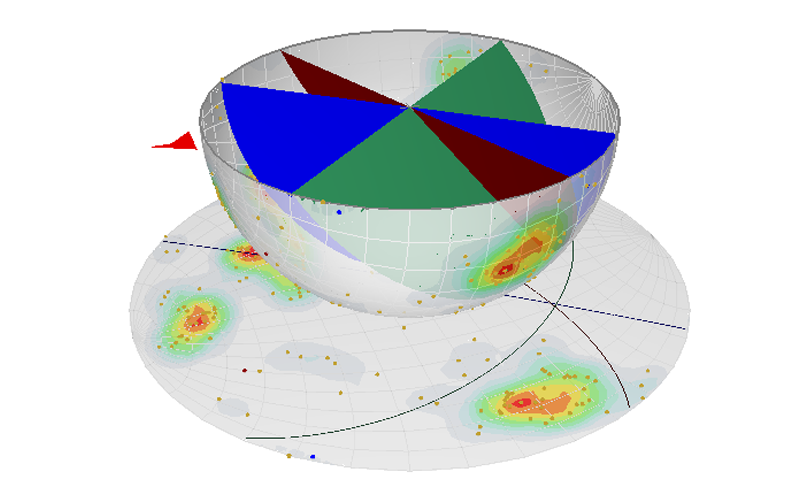 Introducing the 3D Stereosphere, allowing you to plot poles, planes and contours on a 3D hemisphere view, which is the basis for generating a 2D stereonet. New Curved Borehole Analysis eliminates the need for you to manually subdivide curved boreholes into linear segments. The Kinematic Analysis option in Dips now offers an additional feature: Kinematic Sensitivity Analysis of slope parameters. A new addition to the stereonet toolkit is the Intersection Calculator. You can now easily find the exact intersection of two planes, or the plane that passes through two points. 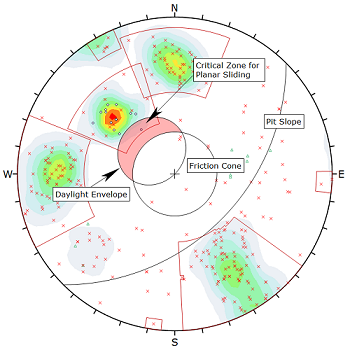 A Pole Plot is the most basic representation of the orientation data. On a pole plot, points are plotted on a stereonet that correspond to the orientation of either (1) linear features or (2) poles representing planes. A Scatter Plot permits visual analysis of pole distribution by plotting symbols representing the number of approximately coincident poles at a given orientation. Symbols on this plot correspond to actual grid locations, and the quantities represented are the numbers of poles within a half grid spacing of the grid point. A Contour Plot is the main tool in Dips for analyzing mean and/or maximum pole concentrations. It is used to visualize the clustering of orientation data not immediately evident from a Pole Plot or a Scatter Plot. The contours represent statistical pole concentrations, calculated using the distribution method (Fisher or Schmidt) specified in the Stereonet Options dialog. A Terzaghi Weighting can be applied to a Contour Plot to correct sampling bias from data collection and to generate a weighted contour plot if the Dips file contains Traverse information. The Major Planes Plot option in Dips allows the user to view planes only on a clean stereonet, without poles or contours. In addition, a listing of plane orientations is displayed in the legend, in the format governed by the current Convention. A Contour Plot can be overlaid on Pole, Scatter, or Major Planes plots, with the Overlay Contours option. A Contour Plot is the main tool in Dips for analyzing mean and/or maximum pole concentrations. It is used to visualize the clustering of orientation data not immediately evident from a Pole Plot or a Scatter Plot. The contours represent statistical pole concentrations, calculated using the distribution method (Fisher or Schmidt) specified in the Stereonet Options dialog. 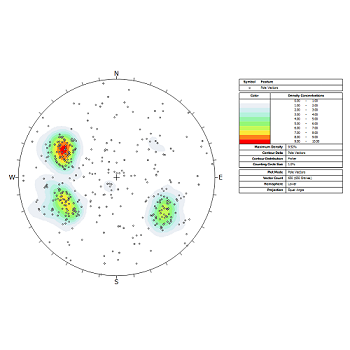 Add Set Window allows the user to draw windows around data clusters on the stereonet to obtain mean orientations of data (poles) within the windows. 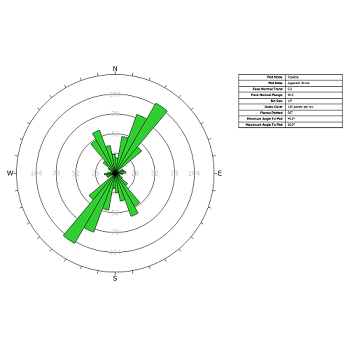 The mean orientations can be plotted as poles and/or planes on the stereonet, and set statistics (confidence and variability cones) can be plotted (Edit Sets option) or listed (Info Viewer option). The Kinematic Analysis option for rock slope stability analysis, allows the user to quickly and easily evaluate the potential for planar sliding, wedge sliding, flexural toppling and direct toppling failure modes. Simply input the slope orientation and friction angle, choose the failure mode, and a template is overlaid on the stereonet, highlighting the critical zone. The number of poles or intersections in the critical zone is automatically calculated and displayed in the legend. The analysis is highly interactive – you can change the input parameters and the stereonet view and analysis results are updated immediately on the screen. You can quickly perform a sensitivity analysis by varying input parameters and exporting results. With the Kinematic Sensitivity option, you can enter a range of values for slope dip, slope dip direction, friction angle, and lateral limits, and plot the results for different failure modes (e.g. planar sliding, wedge sliding, toppling). The plots allow you to quickly see the effect of individual variables, while keeping others constant at their mean values.